Discussion in 'General Taekwondo Discussions' started by Gnarlie, Sep 28, 2015. Is it OK for the shoulders to face slightly away from the target? Do the head, front shoulder, hip and foot have to be in a straight line? Should the chest be facing the target slightly? Is it necessary for the standing foot to rotate fully 180 degrees heel to target? What do you all think? We are all built slightly differently, and our abilities change depending on our circumstances. The above are all common factors that are either unclear or that people struggle with. Is there leeway? * Turning the shoulders is fine, just a slight amount, puts more a little more hip into the kick and allows for a higher kick. Turning the toes downward slightly will give this amount of body rotation. * If the body is not in alignment, you lose power due to loss of body mass behind the movement and it the lower back takes a beating by not having the support it needs while kicking. (the words may not be precise but the idea is there, I hope). * By pivoting, you achieve penetration and apply body mass to the kick using a similar principle to the "drop step" (see Jack Dempsey's book on boxing). Pivoting on all kicks to the side also takes the torque off the knee. * There are some physiological differences but most people need to follow the alignment and pivoting principles. For instance, if there is a sharp twinge in the hip joint while kicking, than there is a possibility the adductors are weak or there could be a physiological issue that a doctor should check. * I think there is some leeway but not much. People's bodies are, mostly, built the same way and can, therefore follow proper biomechanics and kinesiology. People seem to think that just because no pain if felt that no damage is being done. This is a false and very dangerous assumption to make. I look forward to reading the other thoughts as they appear. Here are some examples. Which do you view as good / bad examples? Depending on style/systems, the first and the last are the worst because they are leading toward a bad, unhealthy, and unsafe back side kick. Pictures three, Bruce's kick is almost perfect, it looks like. His leg seems to be slightly ahead of his hips (and this is correct for some arts (Shotokan's snap side kick) and physiology. In picture 4, she is leaning too far back. A 45 degree angle from upright is thought to be optimal. If you lean too far back, the force generated will tend to drive the kicker back reducing penetration and power. Her foot kicking foot is said, by some, to have a "proper" non-knife edge form. The others are close to perfect from angles in the pictures. One note from some is that to use the knife edge on a side kick reduces power due to the inherent weakness of the ankle and edge combined. To keep the foot flexed up (picture a front push kick horizontally and as in picture four) offers, in the experience of many (including my own trial), more stability and, therefore, more power. The knife edge is okay for the throat and other soft targets. Picture four, her body is inclined more then 45 degrees from upright, This will tend to make her rebound off the target thereby reducing the penetration and power. I pretty much agree. The first and last picture represent a version of side kick I am seeing more and more lately and I don't like. If you're looking over the back of your shoulder, It's a back kick, and poor one at that. All the pictures apart from Bruce and the korean guy are not great IMO. People sacrifice technique due to poor flexibility and the desire to kick higher. They twist, lean and fall away from the kick in varying degrees. The kick is thrown ballistically with a swing rather than controlled to target. This creates a non linear path, losing power, and disturbs the kicker's balance. I take a balanced view on the foot knife, it depends on ankle structure of the individual. Personally, my ankle only rotates about 5 degrees into foot knife, and I can happily stamp on a hard surface without injury. Some people I know can rotate more than 45 degrees, and would risk injury stamping. I really believe Yeopchagi is a kick that people underestimate in terms of technical difficulty. There are a lot of factors at play. I see a lot of bad side kicks and not many good ones. Even the chamber and post kick positions are their own can of worms. My preference is to kick within my limits with good form. Like Bruce in the picture. A good visual is that any kick to the side must create a Y shape at full height while a back kick (with our schools) must form an upper case "T" for proper and safe alignment. I do note that many TKD schools teach a back kick as a back side kick. This enables a higher kick. Our school (and Kuk Sool Won) teach the back kick like a single leg "donkey kick": the foot it vertical with toes down. We call the TKD back kick a back side kick. A person to watch for a great TKD/Korean-style chamber is Bill Wallace. He teaches it easily. The only issue with him is that he only teaches his method. This is both good and bad (mainly bad). I learned to do my side thrust kick faster using his snap kick training to make my muscles more relaxed. The other chamber (and I train to use this one, as well, when I desire to) is to bring the foot to the side of the knee and flick it out at more of the forward angle (about 25 degrees from the straight out to the side and Tom Kurz and his side dynamic stretch). Our black belts keep telling the students that they want to see head high kicks even though they cannot kick properly to their knee level. I keep stressing that is not proper kick training and to kick as high as the flexibility and their ability to keep proper form allows. I do not kick any higher than my solar plexus because my ability does not allow for the proper form yet (we are there to be examples and the kids mimic what they see, too). I also keep stressing to turn that base foot at least 45 degrees when kicking to the side. Most of our BBs do not stress this, as well. Re paragraph 1, that is true for a solar plexus kick, buy for higher kicks the relationship changes. A good guide is the upper body should be angled roughly half way between the two legs. For a vertical side kick, that is a horizontal body. Re para 2, the back kick: Both variants of back kick exist in TKD, toes out or toes down. Whether the toes are down are not is not the defining characteristic of back kick. The direction and primary muscle set providing the power (glutes) are. Back side kick in TKD typically involves a greater turn of the hip; belly towards ground, back kick, belly to side, side kick. Bill Wallace is great. I am not a fan of sidekicking directly out of Hakdari Seogi, without opening to a higher chamber. I find the kick loses power and tends to swing upwards, losing its linear quality. I agree with your last paragraph. Too much focus on kicking height without adequate understanding of the technique is likely to result in a poor unbalanced kick at best or even serious injury in the worst cases. For the angle, I find, if kicking anywhere above the waist, if the body becomes parallel to the ground then loss of centre-line, not necessarily balance, and power is lost and bouncing off the target occurs. I think that idea is more a preference. Shin Moo HKD is an extreme example of the theory. They put their hand on the ground for any kicks to the side. I practice the Okinawan/Shotokan method because it is fast and linear. There is less telegraphing while, as you pointed out, there is less power. If done right, the knee chamber can pack quite a wallop just like the jab if done properly as in a straight line up to the target. Yes, the jab can be a power punch, too. Albeit more limited than the right straight (the cross is an up and over kind of punch so it is not a straight). Touching the ground during kicks has its place. This typically happens where the kick has a self defence application involving evasion. The upper body target is removed by ducking away. Not my personal preference, but certainly common in old school Korean SD involving leg sweeps, and retaliation kicks to the knee and gut. Paragraph 2 I find for any side kick 180 turn in the standing heel offers the best open hip for kicking height, and prevents lateral strain on the standing knee. However, in some people, this amount of foot turn creates too much hip turn in the kick. Their hip flexors are weak, therefore their body automatically turns away and recruits the glutes to help with the heavy lifting, creating a suboptimal kick as we discussed. For those people, a smaller turn may work better, but only if they have sufficient adductor flexibility to keep the kicking knee high from the chamber through the motion to the end position without having to drop the kneecap to face the ground. I feel a slightly smaller than 180 degree angle also offers a degree of side to side (belly to back) stability through the kick too. It's a trade off, and I think it comes does to individual structure in the hip and leg. I know a lot of instructors insist on 180 degrees, and a lot of crappy side back kicks are the result. Instructors who insist on 180 should be showing exercises to build hip flexor strength to avoid that turn to recruit the glutes. Last para: I think the knee chamber is a different kick. It has a place, and the chamber appears in several forms. It is difficult to execute in such a way that it does not slide up a vertical target, unless the leg is brought to chamber in flight. At the beginning of Koryo Poomsae, alot of korean instructors spend a lot of time trying to discourage the flicky, lower leg only side kick. The one that looks like a turning kick but with a foot knife shape. Typical wrongly executed Kodeup Yeop Chagi is low turning kick with a foot knife position, then head height side back kick turned in way too far at the hip. Both should be proper side kick posture. This irks me! Shoulder should slightly face the target, rather than turning away. 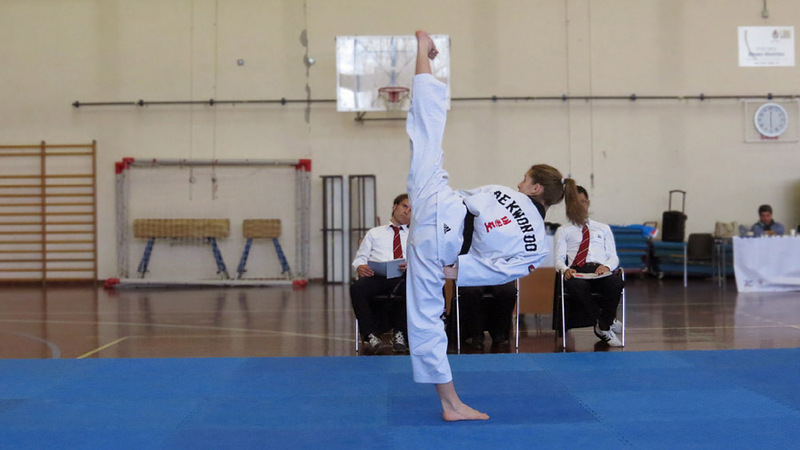 People turn away to 'cheat' thee way to a higher kick. In saying this it can be tough to get all things aligned but for the most part we should try. Suska looks a little off 180, yeah? I agree about that shoulder, I think the ubiquitous turning away is a result of people not being persistent enough in the struggle to perfect the kick, and being tempted by that easier height they can swing the kick into. I really think correct side kick posture is very complex. I agree, sidekick is a highly technical kick that takes a lifetime to perfect, too many people just stick their leg out and hope for the best. In picture Suska manages to adhere to the points we have mentioned before but for a very high kick. Suska is a talent, for sure. I do feel that he is also (I include Chloe Bruce here too) lucky enough to be born with a combination of hip and muscle structure that lends itself to development for high kicking and holding of said kicks. Doubtless these people put in the work, but there is a certain amount of genetic advantage at play. This is what I mean when I say we are all built slightly differently. If it were easy, everyone would be doing it. For mere mortals without said genetic advantage (I include myself here, obv) , it is doubly important to fully understand the practice, mechanics and posture involved in a kick like this. That allows us to squeeze every last bit of potential out of whatever genetic advantages or disadvantages that we might have. I have never really understood why Chloe Bruce doesn't compete on the standard WTF (as opposed to flashy freestyle) poomsae circuit as well as doing what she does. She could do very well and make a lot of cash out of endorsements and seminars. The interesting thing however is that Shotokan makes a distinction between the two variants, Taekwondo does not. 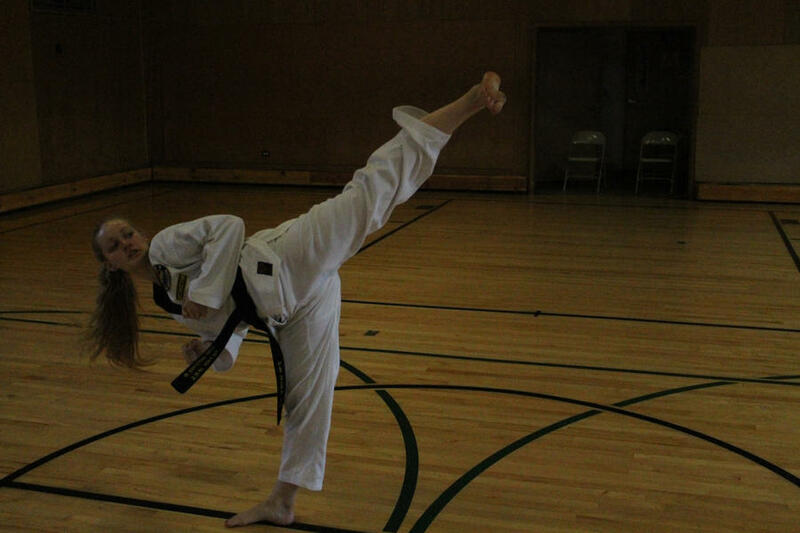 Simply put, TKD does, mostly, the side thrust kick (pic 1) while the side snap is less prominent. I learned the side/front thrust, side/front snap, and side/front push kicks in my original hapkido classes in '85. Since then, WKSA and my hkd now, do not teach all three but I do because I refuse to remove any tool from a student's toolbox. Why do you write Shotokans snap kick ? Are you suggesting that TKDs snap kick physiology is different, then? Bruce Lee learned sidekicks from Jhoon Rhee, a TKD stylist.